When the clocks spring forward in April up until October when the nights draw in, on Tuesday evenings, weather permitting, Clipston Tennis Club meet on court from around 4.30/5.00 pm and play until the light fades (or until we are too weary/thirsty), when we head off to our local, The Bulls Head, for a refreshing pint or two. Some members arrive early and play for an hour or two while others arrive later & stay until dusk. Clipston has two tennis courts which were resurfaced in 2011, after around 3 years of fund raising efforts by members of the Tennis Club with huge support from Clipston residents, and a grant from Lafarge Aggregates. 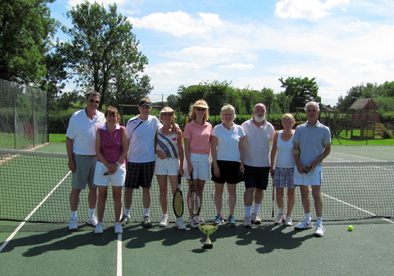 We offer guaranteed and varied opposition by playing short games of either mixed, ladies or men's doubles, depending on numbers. We hold an annual "American" Tennis Tournament, using a format which allows every player to play with and against every other player. This is a fun event which everyone enjoys, and the day is rounded off with BBQ when the afternoon's performances are discussed and elaborated upon! Annual membership is £30 per person. We look forward to seeing you on court! Everybody welcome. For further information please contact: Martin Clarke on 01858 525558.